Here in North Carolina (NC), we're pretty much resigned to the fact that many of the hurricanes in the Atlantic Ocean are going to visit us. NC sticks out farther into the ocean than most of our neighboring states, and that just makes a tempting target for the hurricanes. But Hurricane Florence might be a little different from most ... it's forecast to become a category 4 hurricane (with winds over 130mph), and could possibly even make landfall in Wilmington, NC at that intensity. Just how different is it from past hurricanes - let's analyze some hurricane data! 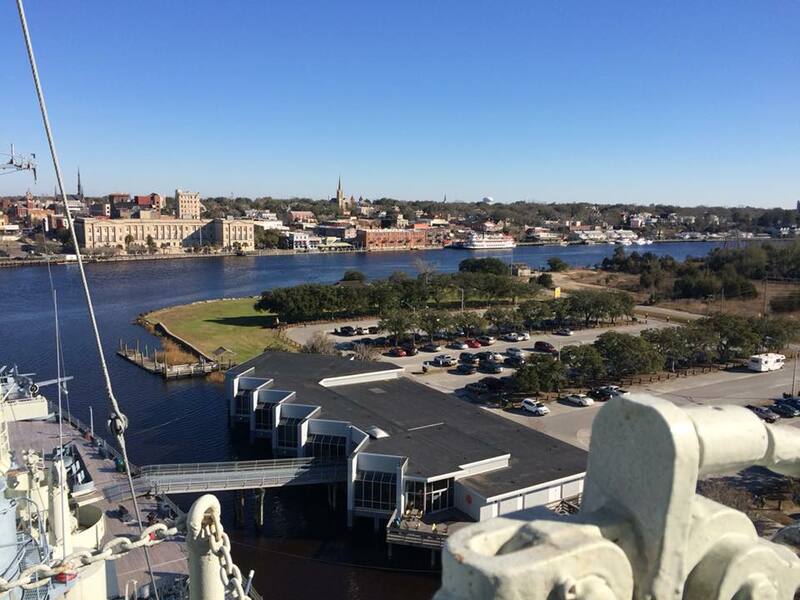 But before we get started here's a picture my friend Beth took from the top of the good-old Battleship North Carolina during a behind-the-scenes tour. The battleship is permanently anchored in shallow water in Wilmington, NC, and will possibly be taking a direct hit from the hurricane. 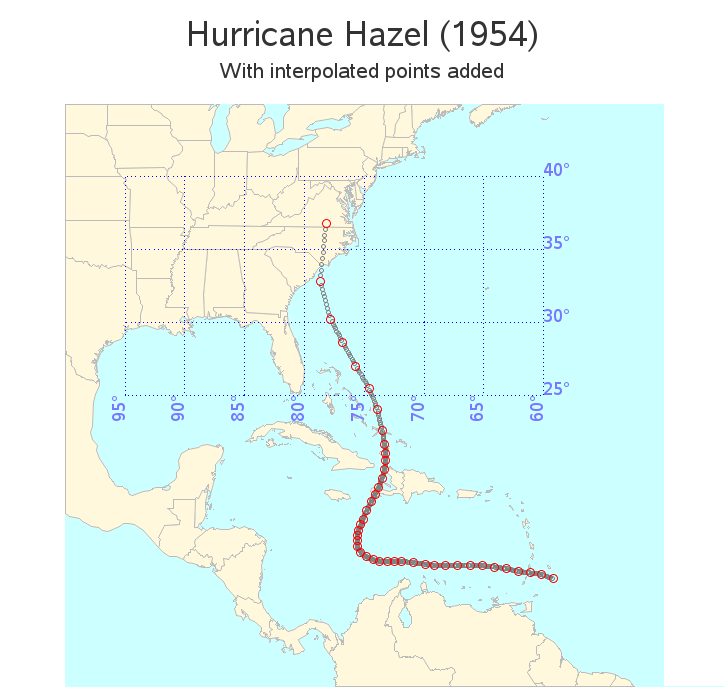 I had heard this was the most intense hurricane forecast to hit NC since Hurricane Hazel in 1954, so I decided to start with that. 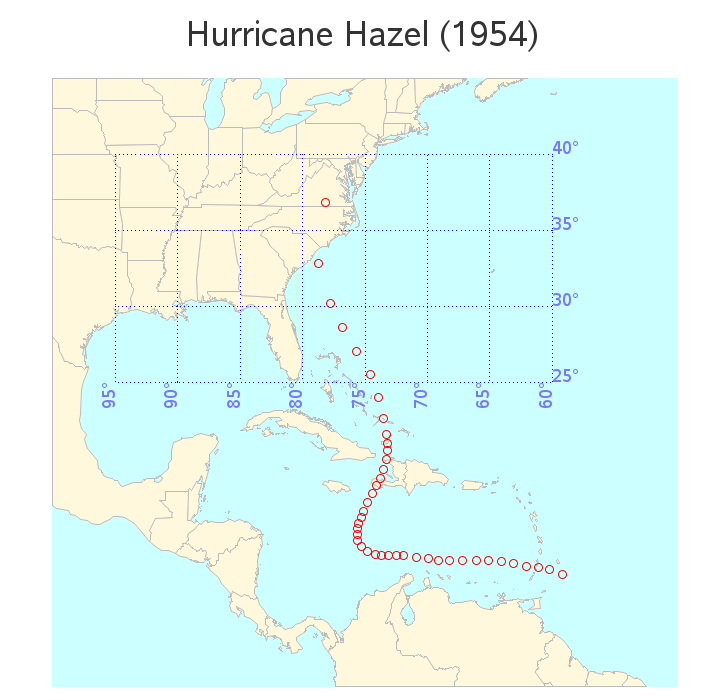 I just happened to have some historical hurricane data (from years 1851-2011) downloaded from the weather.unisys.com website, so I selected the 1954 Hurricane Hazel data, and plotted it on a map. 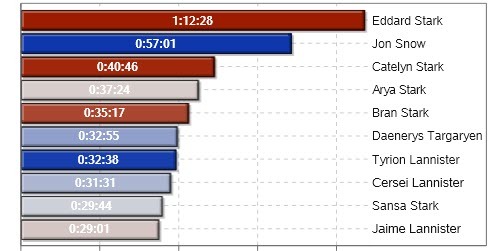 But looking at the results, I immediately noticed a potential problem for the analysis I had planned - since the data points were only taken every 6 hours, there was one data point south of NC, and one north of NC ... but no data points in NC. 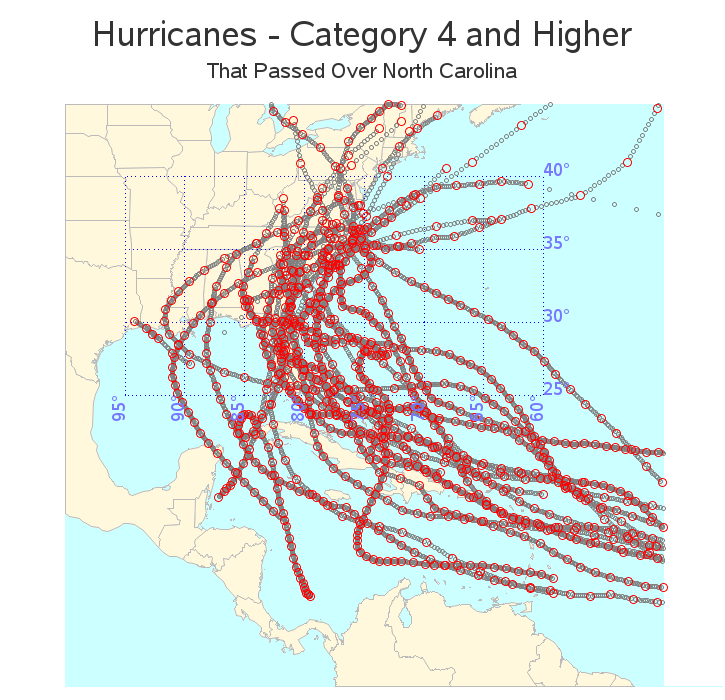 I applied that fix to all the hurricanes, and then used SAS's Proc Ginside to determine which of the category 4 (and higher) hurricanes had passed through NC. That was interesting, but a bit cluttered. Those were hurricanes that had been category 4 any time during their lifetime ... but not necessarily when they passed over NC. What if I subset it to only show hurricanes that were category 3 while they were directly over NC? Ahh ... but remember the Hazel map ... there weren't actually any readings over NC. I tried estimating an average wind speed for the interpolated points over NC (based on the points prior and after), but the much lower inland wind speeds always brought down that average. 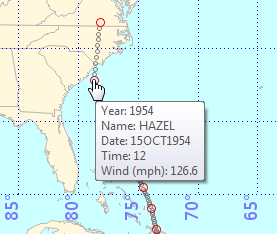 And in the case of Hazel, the last data point over the water was actually just a smidgen below the category 4 threshold of 130 mph (it was 126.6 mph). 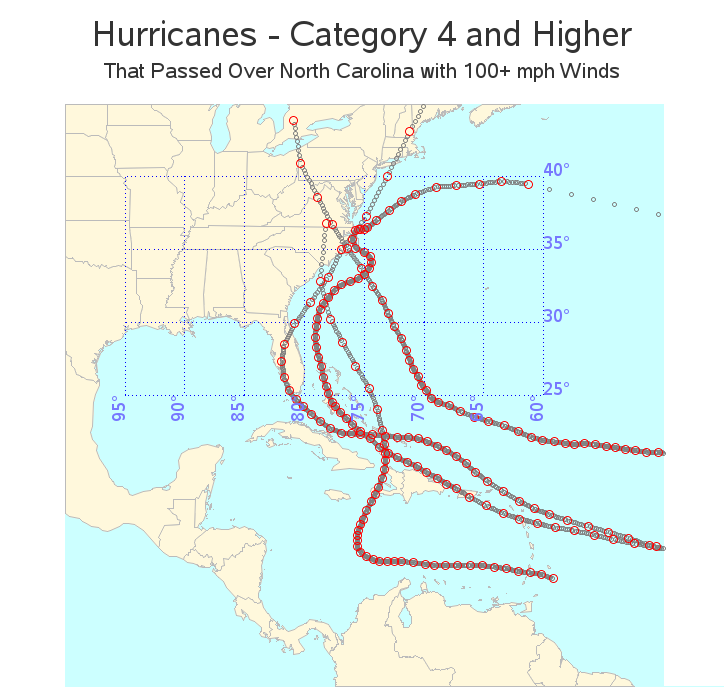 So I compromised a bit, and created a map showing the hurricanes that reached category 4 intensity sometime during their life, and that had wind speed of 100 mph or more while over North Carolina. This narrows it down to four: Storm #3 in 1899, Hazel in 1954, Donna in 1960, and Isabel in 2003. I was 5 years old in New Jersey when Hazel came through. We were without power for a week. Very Nasty. Tape your windows with masking tape and/or saran wrap so shattering glass does not go everywhere if you don't have shutters. Find candles and flashlights and make sure you have matches / fresh batteries the correct size.If you have any of the wind-up chargers / flashlights, make sure they are accessible. Fill up water bottles now. If you have a generator and it is gas-powered, make sure it is somewhere that is vented, accessible - and that you have adequate gas.If you have any old school games (monopoly, etc.) make sure they are out - and that any booklights are easy to grab. Most of all - stay safe and off the roads until the state gives the ok! Do not tape windows. It's ineffective at preventing windows from breaking and only makes larger shards by holding them together and gives people a false sense of security. Make sure your phone is fully charged, in case the power goes out. Also, locate your alternate charging cords, such as the cigarette lighter plug so you can charge it in your car, or using a portable jump-start battery. And if you have an external usb battery supply, make sure it is fully charged. Here are some tips from my friend Margie: Do your laundry before the power goes out. Gas up your cars. Get cash and preferably small bills (because when there is no power, some stores still operate but only with cash). Make ice now! Don't drive around immediately after the storm to look at things because there will be live wires down and - I swear - donkeys on the road.